Automatic Ultrasonic Wash Equipment – ESMA, Inc.
During the ultrasonic degreasing process, solvents dissolve the contaminants on the part which then run off, leaving the part clean and sanitized. Degreasing is performed in a contained chamber because of the pressure properties that allow the process to succeed. Ultrasonic degreasers are similar to ultrasonic washers or cleaners in that they use high frequencies to create millions of tiny bubbles that perform a scrubbing action and reach into grooves and hidden parts of products that are immersed into agitated water, solvent, or vapor. Though tightly bonded soils, greases, and contaminants cannot always be removed with the use of ultrasonic degreasers alone, combining traditional cleaning techniques with ultrasonic cleaning technology has been found to be an effective and environmentally-safe method of cleaning. Ultrasonic degreasers are capable of cleaning individual parts as well as multiple items simultaneously and are used in a variety of commercial and industrial applications in the fabrication, metal processing, automotive, pharmaceutical, electronics, and weapons industries. There are two methods that are combined in ultrasonic degreasers: ultrasonic cleaning and vapor degreasing. Ultrasonic degreasers are composed of metal tanks equipped with heating elements in the bottom of the tanks that heat special cleaning solvents to a boil in a closed vessel. As the solvent evaporates it rises to a chamber where the part is placed. Because of the difference in temperature, the solvent condenses onto the part, dissolves the stain, and drips off of the part. The stain particles are contained in the liquid beads of the solvent which may be collected, filtered, and reused. The other process is conventional ultrasonic cleaning. The transducer sends electrically signaled ultrasonic frequencies travel through liquid, stretching and compressing the cleaning solution until the molecules can not be stretched any further. The liquid breaks apart, creating innumerable bubbles that form under negative pressure. The size of these bubbles increases until equilibrium is reached and the bubbles are rapidly compressed. Millions of tiny powerful microbursts from the collapsing bubbles perform a scrubbing action that cleans every surface of the item. This process disrupts the adhering soils and thus cleans the part. The tanks also have cooling coils near the top that help condense the vapor. Other common features of an ultrasonic degreaser include filters, water separators, safety controls and refrigeration capabilities. 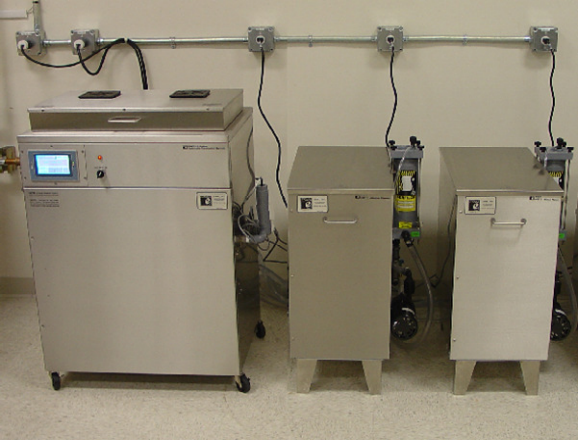 Ultrasonic Degreaser Ultrasonic degreasers are used to clean and sanitize critical parts by incorporating ultrasonic immersion cleaning and conventional vapor degreasing. These devices are used to remove oil, paints, stains, grease, dirt, wax, lubricants, and other contaminants or coatings from parts and machine components.